To Sum It Up: Pilgrims flock to Bicho Raro, Colorado, home of the Soria family, in search of a miracle. While the Sorias can perform miracles, they are forbidden from helping the pilgrims permanently banish their darkness, lest the Sorias bring the darkness onto themselves. Cousins Beatriz, Daniel, and Joaquin know this rule as well as any Soria, but when Daniel, the Saint of Bicho Raro, finds himself battling the very thing all the Sorias fear, it’s up to Beatriz and Joaquin to find a way to save their beloved cousin. 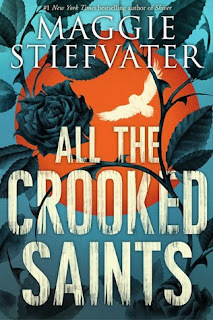 Review: Soooo, according to Goodreads, I began reading All the Crooked Saints on July 31, 2018, and finished it on December 9, 2018. And this review is posting in January of 2019. Yikes! So, what happened here? I did read a few self-help books for work during that stretch but . . . what happened here?! Maggie Stiefvater is one of my all-time favorite authors! Looking back at how long it took me to read All the Crooked Saints, I’d say that 90% of it taking forever was due to life and necessary adulting usurping reading time. The remaining 10% was due to just not finding my groove with this book. There was nothing really concrete that I disliked about it. Stiefvater’s prose is as beautiful as ever, and once again, she has assembled a cast of finely crafted characters. I think my struggle here was the same as it was with another Stiefvater standalone, The Scorpio Races. Both novels moved very slowly for me, and I found it challenging to get invested. I did manage to find more investment in All the Crooked Saints than I did in The Scorpio Races thanks to the compelling backstories of the members of the Soria family and the miracle-seeking pilgrims who still haven’t left the Sorias’ home in Bicho Raro, Colorado. I also loved the contagious charisma of Diablo Diablo, AKA Joaquin Soria, pirate radio DJ extraordinaire, and the role that his rogue broadcast, engineered by Joaquin’s clever cousin, Beatriz, played throughout the novel. The last 70 pages really picked up for me, and when, after reading this book in fits and starts for about four months, I reached the last page, I realized that I’d quite enjoyed the book. Maggie Stiefvater is brilliant at threading magic through reality. Pilgrims with coyote heads or nonstop rain falling over them are entirely the norm in Bicho Raro. My rating does reflect the difficulty I encountered with the book’s overall pacing, but the strong finish left an impression deep enough to bump the rating up by another half star. No ravens or quests to find sleeping kings to be found in this one, but there are owls and an atmosphere infused with magic that makes Bicho Raro much more than just a setting for a story about saints and pilgrims. All in All: Although it took me quite a while to get into All the Crooked Saints, it ended up being the type of read that grew on me the more I thought about it.